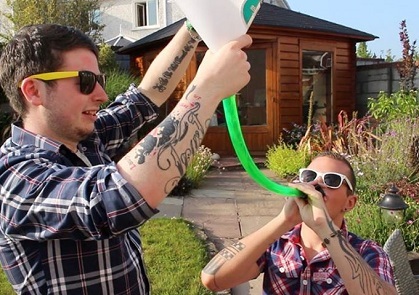 Ireland's second largest city, Cork, has gotten its very own version of popular TV format Jersey Shore with a 10 minute mockumentary appearing on YouTube and gaining over 35,000 views since it was published yesterday. The first installment of the series follows the plights of seven local Corkonians as they are filmed enjoying a typical day in the 'Peoples' Republic,' as Cork is called by locals. The clip is trending in Cork on Twitter, has amassed 13,000 likes on its corresponding Facebook page, and has even drawn attention from local and national media. The project is the brainchild of production manager Stephen Randles who told a local newspaper that he came up with the idea after himself "and a couple of friends decided that it would be a fun thing to do." Auditions were held for the video, which is currently only available on the internet, and which was shot over a 24 hour period. The concept is based on popular US TV show Jersey Shore which had a roll-out in the UK as Geordie Shore and in Tallaght, Dublin, as TV3's notorious Tallafornia. A local nightclub sponsored the production costs.